I don’t know if this has already occurred to all of you out there (particularly if there are any Toyota executives reading this) but Toyota isn’t currently selling a popular, affordable electric car. Weird, right? You’d think if anybody would be doing it, it’d be Toyota. Toyota even took the Prius on from a regular hybrid to a plug-in hybrid. Nearly a third of Prius buyers at this point are getting acquainted with plugging their car in for juice, as Inside EVs reports. Sales of Prius PHEVs aren’t all that far behind Tesla Model 3 deliveries. Toyota has the cred to make an eco car like an EV, and it has the reputation, and it’s had the time, too. Toyota partnered with Tesla, the most successful EV-only car company of the modern age, to work on EV tech together. That Tesla-Toyota partnership even produced an electric small crossover, the RAV4 EV before the two broke up in 2014. But still no mainstream EV from Toyota. Strange! Now, Toyota never said that it was super into EVs. Instead Toyota always talked up hybrids, which makes sense as hybrids are on its existing product lineup, and hydrogen cars. Sure. Hydrogen cars are expensive to develop. New tech. But I’ve heard that hydrogen cars are just around the corner since the first term of Bush Jr. You mean to tell me that Toyota has been dumping all of its EV budget into hydrogen cars for nearly two decades now? I find that hard to believe. At the moment, Toyota says that it’s working on solid state batteries, looking to leapfrog current lithium-ion battery-electric vehicles. Great! I can’t wait for these things to go on sale... whenever that may be. All of this is to say is that is sure is odd that Toyota, probably the best set-up company to bring an affordable mass-market EV to showrooms, still doesn’t have a popular offering. America is overrun with Camrys and RAV4s. You’d think we’d all be driving EV ones by now. Guess not! 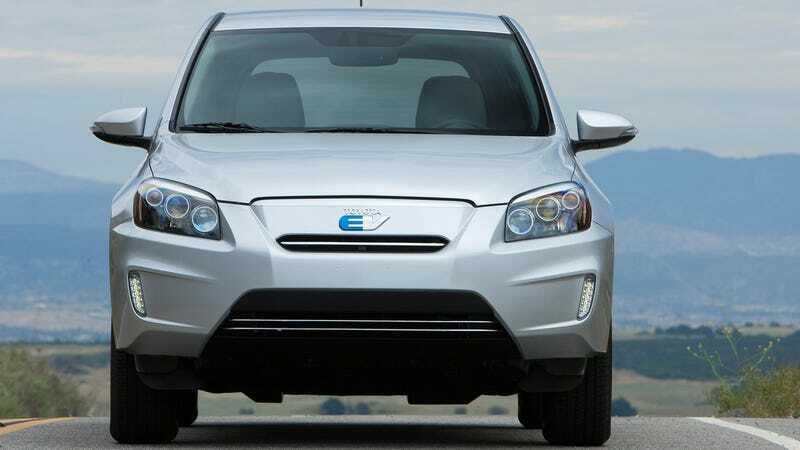 At $18,500, Could This 2014 Toyota RAV4 EV Rock You Down To Electric Avenue?